Trophy shot: A beautifully executed capture of a frequently photographed scene. In Monday’s post I wrote about relationships in nature. They really are everywhere, these juxtapositions of landscape, light, and sky that we photograph by virtue of our timing, position, and creative vision. In their pursuit, photographers label photo spots a “sunrise location” or “sunset location,” research the best time to photograph pretty much every popular landmark, plot the when and where of the moonrise, and…, well, you get the idea. Unfortunately, in this age of ubiquitous cameras and limitless information, these easy relationship images have become cliché, a “trophy” to display in what seems to be a never-ending “top-this” cycle. While putting a beautiful scene with good light or a vivid sky makes a great foundation for a nice image, elevating an image above trophy status requires a serious infusion of creativity. In other words, rather than settle for an image that’s merely a flawlessly executed version of the same scene we’ve all seen hundreds of times, photographers should be seeking unique relationships between the scene’s varied elements, relationships that look deeper than the conventional treatment. 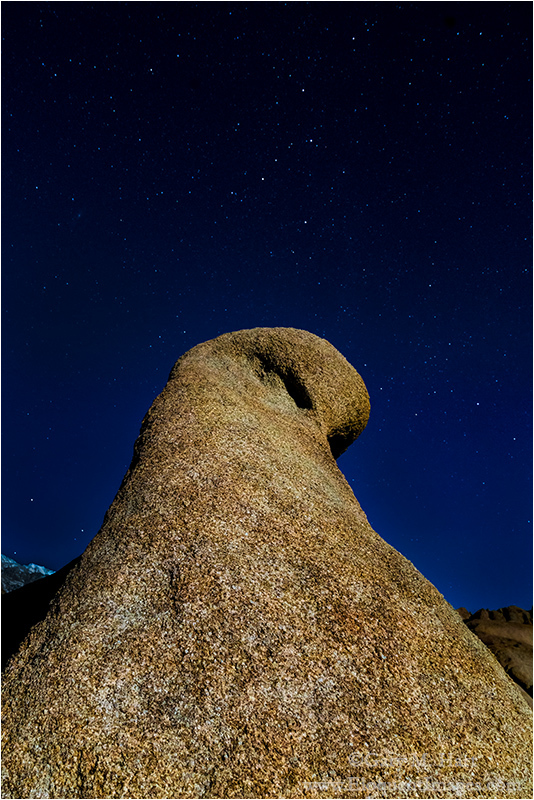 (Like many other photographers) I’ve photographed California’s Alabama Hills a lot. Here stacked, weathered granite boulders provide a dramatic foreground for Mt. Whitney and the precipitous eastern escarpment of the Sierra Nevada range. Despite an almost infinite variety of potential foreground subjects, the Alabama Hills trophy shot is Mobius Arch (aka, Whitney Arch), which makes a striking frame for Mt. Whitney. Some version of this composition has been a prime goal for many photographers, but like most easy captures these days, there’s rarely anything special about Mobius Arch images. As with any location, it helps to start with a nice sky and good light. The natural relationships I try to add to the Alabama Hills’ beauty include sunrise alpenglow on Mt. Whitney, warm light on the granite boulders, and the moon’s disappearance behind the serrated, snow-capped peaks. But as beautiful as these phenomena are, they’re still not enough to set one Mobius Arch image apart from the other. As a workshop leader I have to take my groups to the arch because if they’ve never been here before, it’s probably what they came to see. But my job doesn’t end there—it’s also incumbent on me to help my students find alternate compositions that use the arch in a unique way, or don’t use the arch at all. I encourage Alabama Hills first-timers to seek relationships that combine the foreground rocks, distant peaks, and whatever is happening in the sky in ways they haven’t seen before. It can take a while, but the longer they work on a scene, the more the hidden relationships start to appear. Eventually most tire of the arch and start wandering off to explore the countless other opportunities nearby. Arch or not, a particular Alabama Hills favorite of mine is moonlight, especially in winter, when the snowy crest glows with reflected moonlight. Last month, after three wonderfully cloudy days in Death Valley, my Death Valley workshop group traveled to Lone Pine to wrap up the workshop with a sunset and sunrise in the Alabama Hills. Since our Death Valley moonlight shoot had been preempted, after dinner in Lone Pine I took everyone up to the Mobius Arch area to give moonlight one more try. The sky that night cooperated wonderfully. I started by bouncing between photographers making sure they’d mastered the exposure and focus challenges of moonlight photography. It wasn’t long before everyone was up to speed (it’s not hard) and scattering in search of their own moonlight boulder, mountain, and sky relationships. Leading a group doesn’t allow me to do creative photography and natural relationship hunting, but that night I did find a couple of minutes to photograph some favorite compositions in the moonlight. It’s amazing how easily the eyes adjust to moonlight, and soon found myself composing as if we were shooting in daylight. It was also quite cold on this January night, but it’s amazing how easily the cold is ignored when the photography’s good. When the cold started to trump the photography, I walked out to the arch to round up the people who had ended up there. As I said, I don’t get to hunt for the creative relationships when I’m with a group, but as I was exiting the arch I glanced skyward and saw Cassiopeia hanging in the northern sky. What stopped me was the way the arch’s angled profile seemed to lead directly to the constellation. Since I’ve always found this side of the arch interesting without ever finding something to put with it, I quickly extended my tripod and attached my camera and 24-70 lens. Lowering the camera to about three feet above the ground emphasized the steep slope and compressed a large chunk of mostly empty sky separating Cassiopeia and the arch’s top. In most of my moonlight compositions, even wide open the focus point for the entire scene is infinity, so I simply autofocus on the moon. But with the arch’s textured granite starting just a couple of feet from my lens, I knew I needed to be careful with my depth of field and focus point. To increase my depth of field I stopped down to f8, compensating for the lost light by cranking my ISO to 3200 (love the high ISO of the a7RII). I tried a couple frames using nothing but moonlight to manually focus, but after magnifying the images in my LCD, it was clear that I’d need focus help. I asked one of the guys in my group to shine his flashlight about a third of the way up the arch, focused, and clicked. After a quick check of the LCD confirmed that I’d nailed the focus, I packed up my gear and headed back to the cars. This was my only sharp frame. Another thought-provoking and well-written article. Despite not being able to set up at a prime spot for the classic sunrise shot during your workshop last October, I still managed to get some decent compositions with and without the arch in the foreground (still had to clone out fellow photographers from the base of the arch). The same situation occurred at Mesa Arch in 2011. Before the 2016 Eastern Sierra workshop, I will come back to this blog post to review your advice and look forward to finding more compositions with varying focal lengths at this location, as well as all of the others. Thanks, Julie. Yeah, there always seems to be more photographers than room at the prime locations. It can be frustrating, but sometimes it turns out to be a blessing when you get the shot no one else got. It seems most workshop participants are quite willing to give others a chance when they’re aware of the situation—unfortunately, they’re often so focused that they don’t notice. That’s why when I notice people in my groups hogging the best spots, I try to make sure everyone gets a chance, but sometimes I don’t catch it. But if there’s ever a shot that you’d really like, just let me know.